When medium-size breeds start to look more like a large, they’re at increased risk of heart disease, joint pain, and never being able to catch a squirrel again. But losing weight doesn’t mean losing taste! 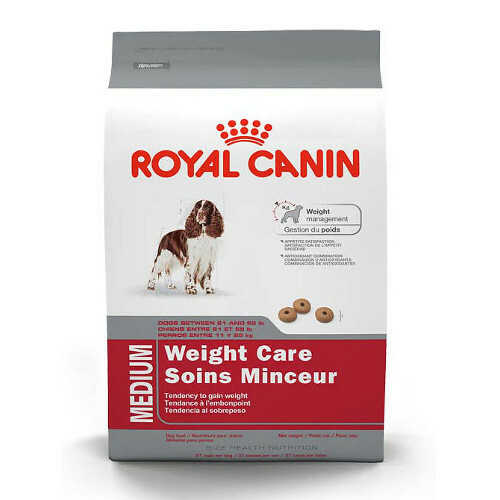 Royal Canin Medium Weight Care Dry Dog Food is a weight watcher’s kibble perfect for maintaining an ideal body weight in pups between 21 and 55 pounds. The low-calorie formula is boosted with L-Carnitine to help burn fat, boost the metabolism, and ensure your pal is around for plenty more nights of snugglin’ on the couch. Chicken by-product meal, barley, corn gluten meal, wheat, brewers rice, pea fiber, powdered cellulose, corn, rice hulls, natural flavors, chicken fat, dried beet pulp, grain distillers dried yeast, fish oil, calcium carbonate, salt, vegetable oil, fructooligosaccharides, L-lysine, potassium chloride, hydrolyzed yeast, choline chloride, vitamins [DL-alpha tocopherol (source of vitamin E), L-ascorbyl-2- polyphosphate (source of vitamin C), biotin, D-calcium pantothenate, vitamin A acetate, niacin, pyridoxine hydrochloride (vitamin B6), thiamine mononitrate (vitamin B1), vitamin B12 supplement, riboflavin (vitamin B2), folic acid, vitamin D3 supplement], trace minerals (zinc proteinate, zinc oxide, ferrous sulfate, manganese proteinate, manganous oxide, copper sulfate, calcium iodate, sodium selenite, copper proteinate), L-carnitine, rosemary extract, preserved with natural mixed tocopherols and citric acid.